Every week, a group of students that I help teach gather together and work on public speaking skills. 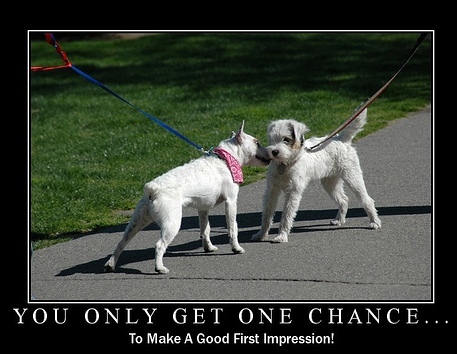 One of the first things I always focus on as we maneuver the waters of addressing others in public, is that you have ten seconds to make a good first impression. For my students, they don’t really understand the power of this simple concept just yet, but when I can act out numerous funny scenario’s, and ask them to choose which of my “characters” they would pick to be friends with, they always gravitate to the “friend” who shows direct eye contact, seems interested in listening to what they have to say and has a warm, generous smile. Even fourth graders understand that you only get one chance to make a good first impression, and often, it’s as easy as some of those simple steps, but primarily, they thought is was important to smile. For me, a smile from someone can do more than just make a good first impression, a warm smile can break down barriers. A warm smile invites and welcomes. A warm smile can include those that are left out and assures others that they did a good job. I think we diminish the power of just how many ways a simple, welcoming smile communicates and even calms others. With all that being said, can you tell I am pretty passionate about my children learning that smiling is an important part of how to make a good first impression? Well, many of you may not know that I do quite a bit of public speaking. As much as we women stress out about what we are going to wear to an event, or how our hair looks, I know that if I am warm, welcoming and real when I meet people, that’s more important than everything else put together. That is something I want my daughters (and sons) to learn. For my eldest daughter, it’s something we’ve actually had to work on and practice. Shy by nature, smiling and giving direct eye contact when she speaks to someone new, is difficult for my daughter. So, yes, we role play. Now, our other children are a different story. Isn’t it interesting how our children are all wound up so differently? Oh yes, from the mouths of babes truth is spoken. So when Crest 3D White 2 Hour Express WhiteStrips contacted me as part of this sponsored post campaign, I was all over it. I had just personally used my cold hard cash to purchase Crest White Strips, and I knew they worked. These 3D 2 Hour Whitestrips are a new product promising to deliver even quicker results. Not only am I a believer in making a good first impression through a great smile, I also know that when I feel good about myself, it helps my self confidence as well. A few of us shared some of our opinions about the correlation between confidence and our smile on this Bliss TV video. How do you handle helping your children through the first impression stage or do yo have any thoughts on what you think about first impressions? What a great story! I have used Crest White Strips before and you’re right, they really work. Jen, you are just as beautiful as I remember you. I loved getting to see your little blurb on the video. It made me feel like I was sitting in the room with you. I miss seeing your amazing smile, and your vibrant and contagious personality! But I’m so glad I get to keep up with you here. Great job with this website. You have an amazing ability to uplift and encourage people, yet you remain soooo real and relatable!